Once upon a time, early in my marriage, my mother-in-law bought us some groceries. She got us nice things we would probably never have bought for ourselves - steak, real orange juice, C&H Baker's Sugar, etc. Among the items was a bag of Guittard green mint chips. I love mint, but I had no idea what to do with them. Luckily, there was a recipe on the bag for "Polka Dot Cookies." It was a turning point. 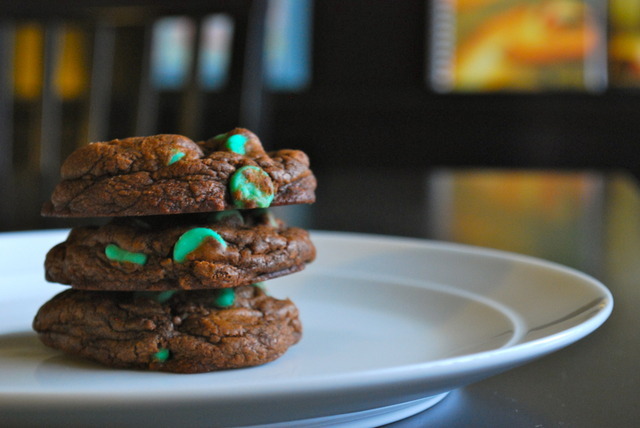 These chocolatey, minty cookies quickly became the most requested dessert in our house. We've made more than our share of grocery store runs simply to get supplies for the mint cookies. With a great chocolate base and a burst of mint with each smooth chip, the cookie has just the right amount of softness and chewiness. (1) The recipe is almost identical to the original, though I have tweaked it or included directions I have found to make the cookies better. (2) Unfortunately, not all areas carry Guittard Green Mint Chips. Most stores in Utah do, but I've had little luck in California and Oregon, and so has my sister in Texas. Many stores (like Winco) will carry them around the holidays, but when you can't find them, Andes chips are the best substitution. York Pieces (the brand, NOT York patties chopped up) and mint M&Ms Premiums (halved) work decently well. (3) The first ingredient calls for Guittard semi-sweet chips. I'm sure most good chocolate chips will do, but Guittard has especially premium melting qualities. Try to use them if you can. Heat semisweet chips and butter in microwave inside a small bowl at medium power (50% or level 5) for 2-3 minutes, stirring well after each minute until smooth. Set aside to cool. In a small bowl, combine flour, baking soda, and salt. Set aside. In a large bowl, beat eggs, sugar, and vanilla until light. Blend in melted chocolate, then dry ingredients. Stir in green mint chips and chill for 10-15 minutes or until slightly stiff. (If you chill it for longer, make sure to roll dough into balls before placing on cookie sheet.) Drop by well-rounded teaspoonfuls onto ungreased cookie sheets (preferably lined with parchment or Silpat). Bake 8-10 minutes. Cookies will be soft in centers but will harden as they cool. -leave cookies on the pan for 5-10 minutes after you pull them. The residual heat helps to bake them a little, but doesn't overcook them. 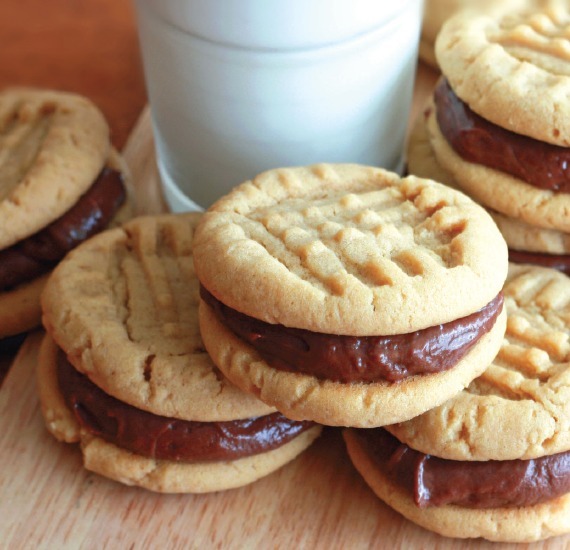 They shouldn't fall apart when you remove them with a spatula, but they will still be a little gooey. Side note: I'm of the mind that some of the best recipes are right on the bag/can/box of an item. After all, the powers that be must test and test different recipes for their product and must only include the best of the best to go on the product itself. So, what great recipes have you found on the side of a can, box, or bag? Six Sisters' Stuff, excerpted from "Copycat Cooking"